Rigaku Corporation is pleased to announce its attendance at the 2018 Materials Science and Technology meeting and exhibition (MS&T 18,)taking place at the Greater Columbus Convention Center in Columbus, OH October 14-18, 2018. MS&T is an annual materials science conference held by four technical societies, offering a technical program addressing structure, properties, processing and performance across the materials community. The event showcases a wide variety of equipment and services to the automotive, aerospace, instrumentation, medical, oilfield and energy industries. Rigaku provides the world’s most complete line of X-ray analytical equipment, and is presenting its diverse range of analytical instrumentation at Booth # 427. 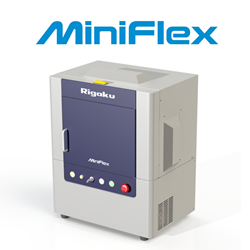 Among the newest systems from Rigaku is the 6th generation https://www.rigaku.com/en/products/xrd/miniflexhttps://www.rigaku.com/en/products/xrd/miniflex benchtop X-ray diffraction (XRD) instrument. The new MiniFlex X-ray diffractometer is a multipurpose analytical instrument that can determine: phase identification and quantification, percent (%) crystallinity, crystallite size and strain, lattice parameter refinement, Rietveld refinement, and molecular structure. The new MiniFlex system delivers speed and sensitivity through innovative technology advances, including the HyPix-400 MF 2D hybrid pixel array detector (HPAD) together with an available 600 W X-ray source and new 8-position automatic sample changer. Also from Rigaku, the Rigaku Supermini200 wavelength dispersive X-ray fluorescence (WDXRF) spectrometer is the only commercially available benchtop WDXRF spectrometer. It features newly designed and simplified software and an improved footprint, combining all of the advantages of traditional WDXRF elemental analysis systems in a smaller, more economical package. The Rigaku SmartLab intelligent X-ray diffraction system is a multi-purpose, high-resolution diffractometer. The SmartLab system is designed for all XRD applications, from powder and thin film diffraction, to small angle X-ray scattering (SAXS) and in-plane scattering. The SmartLab Guidance software provides an intelligent interface that guides users through each experiment.